Review: This review will be kind of unique, as it's been released prior to the release of the Xbox One X, Microsoft's new and world's most powerful. Thus I have played it a while on my Xbox One S and then have waited to play it further until my Xbox One X arrived. I can then compare the two, and it will probably be my only review doing this, considering I'll be playing titles from now on with the XB1X. 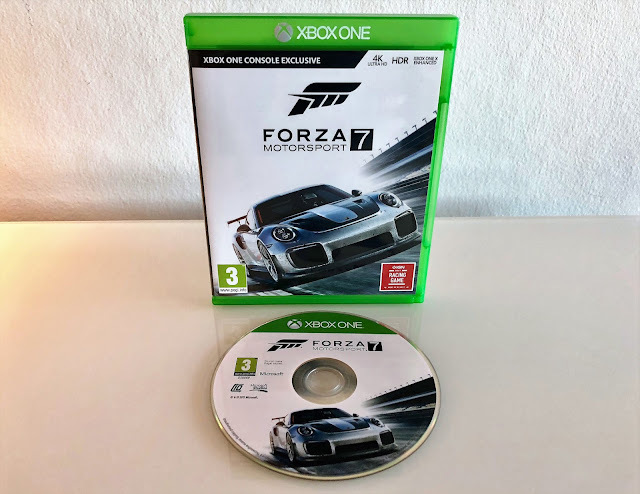 Last year saw the Forza franchise reach perhaps it's highest critical acclaim with the arcade thrills that was the Horizon series third game. FH3 delivered a truly fantastic racer and gained a lot of well deserved popularity, even outside of the typical motorsport enthusiasts too. As for the Motorsport series, the change from going from the pretty, but barebones launch title FM5 to the fleshed out and huge FM6 was a big jump. FM6 was a game I put a serious amount of time into, probably one of my most played racing games in the last ten years. Lots of tracks, night and rain weather added and tons of cars. Going from FM6, and the recent FH3, was always going to need a large change to impress. Lets take a look and see if FM7 delivers this. Homologation. It's a word you'll get familiar with in FM7, albeit it's aggressive wish to homologate your car; basically auto-tune your motor to meet a racing cup's rules. Luckily the amount of variation in leagues and racing genres make FM7's main singleplayer less forced and one-sided than FM6's. This time you can choose between lots of different cups to enter with a variety of car types within FM7's impressive 750+ cars. It's a huge amount of motors that has been built up an added to the total number throughout Xbox One's Forza games. These racing cups allow the player to play at their own difficulty and assist level. In other words, it's about winning cups to earn points towards unlocking new cars and even more cups to join. The lack of awarding a player for not activating rewind, using no ABS brakes, no racing line etc. is a little disapointing though. I really liked the added bonus of extra XP for those willing to risk more for a difficult approach. The only difficulty you can earn more points in here is to adjust the AI level up. It's a sad omission and coupled with the forced homologation to enter a cup makes FM7 restricted in it's own way, as if adjusted towards more casual players. I don't mind all the assists and the gradual learning curve for casuals, no please do try to get more people interested in traditional driving on race tracks, but don't hamper down experienced players. They could easily have had a casual/veteran option to allow one or the other, plus rewarding players wanting to play the game more realistically. There's a few very welcome additions outside of the varied singleplayer though, when compared to FM6; dynamic(ish) weather and new race tracks. Real life circuitss that are new for this iteration is the Japanese favourite Suzuka Circuit and Italy's Mugello, plus Virginia International Raceway, which was a DLC to FM6, have been added. Fan favourite fantasy track Maple Valley does a very welcome comeback to the series from way back in FM4 and a brand new Dubai circuit, winding it's way over deserts and into speedy motorway tunnels under Dubai Int. airport is a nice and beautiful looking addition. Where Prague was FM5's showcase race track and Rio was FM6's equivalent, Dubai is FM7's showcase, stunning circuit to speed around! FM7 really has a nice balance between real racing circuits and fantasy ones, plus the weather can now be partially dynamic in singeplayer races. Going from nightime to early morning, sunsets rise, rain starts pouring and goes away again etc. It's nice additions to make a race feel varied and exciting to play after endless races. I would have liked fully dynamic weather though and options to add any type to custom races, as it stand the dynamic weather is mostly locked to the singleplayer cups. It would only be fair to have a little comparison here since I've played the game on both systems. Firstly FM7 on the One/One S benefits from getting an anti-aliasing solution applied, probably carrying over from the Horizon series. Jaggies appear less harsh and the picture gets a softer look. Amount of grass and texture quality though, seems to be somewhat downgraded if I went all the way back to FM5. I'm guessing its just a matter of priorities and nothing you'll notice much when racing. FM7 is otherwise a fantastic looking title on the stock hardware and impressively has dynamic weather while maintaining that rock solid 1080p@60fps. So how does it look on the X? The first and most apparent change is the extremely clean native 4K image, gone are the jaggies and flickering on edges and objects in the distance. Fences with lots of tiny details look clean all the way into the distance. Cars don't change their level of detail in the distance either, which is important when the viewing distance is so much sharper into the horizon in 4K. There's also a new texture set making all the environments and road surfaces look super detailed and sharp. Grass effects are boosted too. The lighting just shines better in 4K, allowing for tiny details like reflections on various surfaces seem much more pronounced, best example of this is how all the small individual stones in the tarmac reflect. So it's all about the sharpness and cleaner picture, especially in the tiny details on screen. In 1080p they just blur into each other, in 4K they shine individually. Everything from the tarmac beneath your car to rich of details like the cockpit with outstanding detail to it's material surfaces. 4K is perhaps most pronounced when you go closer to your screen, at a distance afar it isn't as clear apart from the vast reduction of shimmering and jaggy edges compared to 1080p. It's all about the viewing distance and size of TV really. 4K benefits strongly if you are close to a screen and have a big TV. When it comes to downsides in FM7, my opinions may come down to slight franchise fatigue, or the fact that I played so much FM6 and FH3 that I feel FM7 doesn't really engage me as much as it should have. Sure, this is the version to go for if you have none of the previous Motorsport titles on your XB1, plus a showcase for your XB1X and 4K TV, but otherwise it just didn't blow me out of the water. Played yourself tired of FM6? Well then there isn't much here for you if you're still on a One/One S console. Missing stuff like the coop option, custom numberplates or fully customisable cups from FH3, disappoints me too. I would have enjoyed being able to activate a more pro setup to the singleplayer modes, letting me build cars from scratch myself. Focusing on choosing the right parts to tune the most out of a standard car rather than be forced in to homologation. I'd also have liked to see more new car models, not previously seen in Motorsport or Horizon games, but I guess they are locked away in DLC car packs. They might all be small complaints, but as a eager Forza player, they are ones I wish they'd took into consideration. Oh, and I need to mention the loading; it's terrible. Although it's slightly faster on the XB1X, they are just so long. Navigating menues during the loading doesn't really negate the fact that the loading is beyond acceptable. Although the most obvious jump from FM6 to FM7 will be on the XB1X version, it still offers a nice racing package for those on One/One S platforms. The added AA helps keep the game from looking aliased and the new tracks and dynamic weather are a welcome sight, the jump in resolution, draw distance and texture quality though make the XB1X version the most desirable for console owners. It helps give the game a sense of a technical jump from FM6 too, while the standard version doesn't do this as much, though this is expected being the third game on the same hardware platform in a series. FM6 was going to be a hard game to surpass, thus perhaps dampening my excitement a little for FM7. It's by no means worse or a bad game compared to FM6, in fact I'd recommend this over it any day. But it doesn't feel like a significant jump other than the extra technical improvements the XB1X brings to the table. A must-have for new X owners for sure, I mean it's a beautiful looking native 4K game running at 60fps locked which is mighty impressive when looking the competition like Project Cars 2 or Gran Turismo Sport, but for One/One S owners there are other cheaper options to purchase if you look at the older Forza games. Singleplayer is a lot more meaty and varied this time around, the number of cars and tracks is huge. Although limited, the dynamic weather brings visual variety and excitement to races. Super sharp and rich 4K graphics for those that upgrade to a Xbox One X, stunning detail for those with a base One and One S too. Very strict vehicle rules to races, homologation feels more limiting than necessary. Not a huge upgrade for One/One S owners over FM6. Insane load times, there's a ton of waiting around for each race to begin.